CALGARY, CANADA - SEPT 21: the Peace Bridge on September 21, 2014 in Calgary, Alberta Canada. 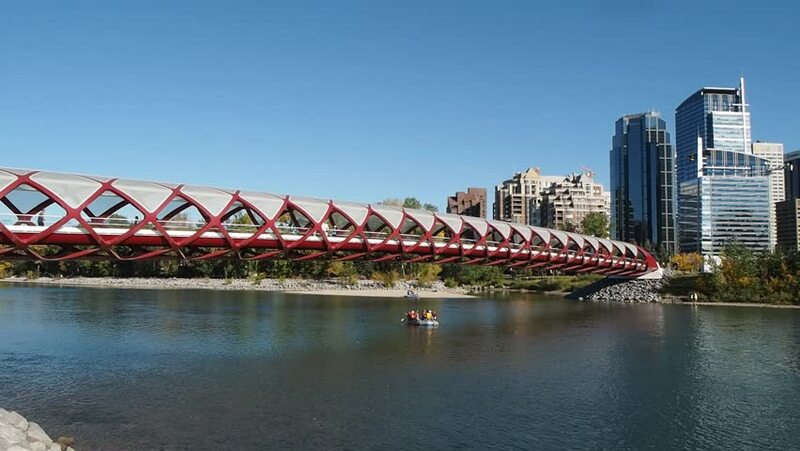 The pedestrian bridge spans the Bow River and was designed by Santiago Calatrava. hd00:20CALGARY, CANADA - SEPT 21: the Peace Bridge on September 21, 2014 in Calgary, Alberta Canada. The pedestrian bridge spans the Bow River and was designed by Santiago Calatrava. 4k00:08Seoul, Korea -Sep 09 2018: Time lapse of Korea at Dongjak Bridge Han bridge Seoul Tower in summer, bright sky, beautiful clouds in South Korea. hd00:22CALGARY, CANADA - SEPT 21: the Peace Bridge on September 21, 2014 in Calgary, Alberta Canada. The pedestrian bridge spans the Bow River and was designed by Santiago Calatrava. 4k00:18Balls Head reserve gum trees underneath flying camera towards Sydney city CBD landmarks at sunset.